If your scenario supports it, it is easier to move data in and out of Amazon RDS by using backup files and Amazon S3. For more information, see Restoring a Backup into an Amazon RDS MySQL DB Instance. 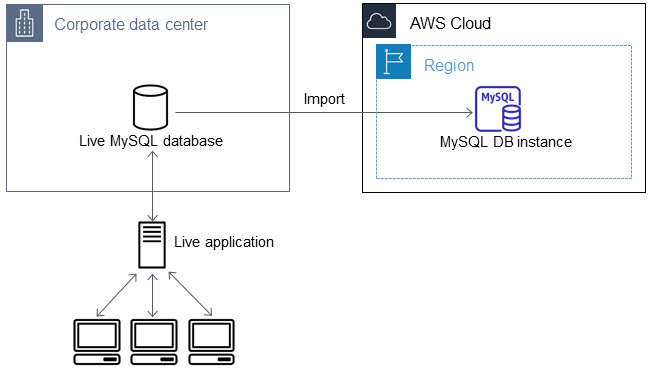 In some cases, you might need to import data from an external MySQL or MariaDB database that supports a live application to an Amazon RDS MySQL or MariaDB DB instance. In these cases, you can use the following procedure to minimize the impact on application availability. This procedure can also help if you are working with a very large database. Here, the procedure helps because you can reduce the cost of the import by reducing the amount of data that is passed across the network to AWS. In this procedure, you transfer a copy of your database data to an Amazon EC2 instance and import the data into a new Amazon RDS DB instance. You then use replication to bring the Amazon RDS DB instance up-to-date with your live external instance, before redirecting your application to the Amazon RDS DB instance. You configure MariaDB replication based on global transaction identifiers (GTIDs) if the external instance is MariaDB 10.0.2 or greater and the target instance is Amazon RDS MariaDB; otherwise, you configure replication based on binary log coordinates. We recommend GTID-based replication if your external database supports it due to its enhanced crash-safety features. For more information, see Global Transaction ID in the MariaDB documentation. We don't recommend that you use this procedure with source MySQL databases from MySQL versions earlier than version 5.1, due to potential replication issues. For more information, see Replication Compatibility Between MySQL Versions in the MySQL documentation. The first step in the process of migrating a large amount of data to an Amazon RDS MySQL or MariaDB DB instance with minimal downtime is to create a copy of the source data. You can use the mysqldump utility to create a database backup in either SQL or delimited-text format. You should do a test run with each format in a nonproduction environment to see which method minimizes the amount of time that mysqldump runs. You should also weigh mysqldump performance against the benefit offered by using the delimited-text format for loading. A backup using delimited-text format creates a tab-separated text file for each table being dumped. You can load these files in parallel using the LOAD DATA LOCAL INFILE command to reduce the amount of time required to import your database. For more information about choosing a mysqldump format and then loading the data, see Using mysqldump For Backups in the MySQL documentation. Before you start the backup operation, you must set the replication options on the MySQL or MariaDB database that you are copying to Amazon RDS. The replication options include enabling binary logging and setting a unique server ID. Setting these options causes your server to start logging database transactions and prepares it to be a replication master later in this process. Your database needs to be stopped to set the replication options and be in read-only mode while the backup copy is created, so you need to schedule a maintenance window for these operations. Exclude the following schemas from the dump file: sys, performance_schema, and information_schema. The mysqldump utility excludes these schemas by default. If you need to migrate users and privileges, consider using a tool that generates the data control language (DCL) for recreating them, such as the pt-show-grants utility. Edit the my.cnf file (this file is usually under /etc). Add the log_bin and server_id options to the [mysqld] section. The log_bin option provides a file name identifier for binary log files. The server_id option provides a unique identifier for the server in master-replica relationships. For more information, see Setting the Replication Master Configuration in the MySQL documentation. Create a backup of your data using the mysqldump utility, specifying either SQL or delimited-text format. You must specify --master-data=2 in order to create a backup file that can be used to start replication between servers. For more information, see the mysqldump documentation. To improve performance and ensure data integrity, use the --order-by-primary and --single-transaction options of mysqldump. To avoid including the MySQL system database in the backup, do not use the --all-databases option with mysqldump. For more information, see Creating a Dump Snapshot Using mysqldump in the MySQL documentation. Use chmod if necessary to make sure that the directory where the backup file is being created is writeable. On Windows, run the command window as an administrator. To produce SQL output, use the following command. To produce delimited-text output, use the following command. You must create any stored procedures, triggers, functions, or events manually in your Amazon RDS database. If you have any of these objects in the database that you are copying, exclude them when you run mysqldump by including the following arguments with your mysqldump command: --routines=0 --triggers=0 --events=0. When using the delimited-text format, a CHANGE MASTER TO comment is returned when you run mysqldump. This comment contains the master log file name and position. If the external instance is other than MariaDB version 10.0.2 or greater, note the values for MASTER_LOG_FILE and MASTER_LOG_POS; you need these values when setting up replication. If you are using SQL format, you can get the master log file name and position in step 4 of the procedure at Replicate Between Your External Database and New Amazon RDS DB Instance. If the external instance is MariaDB version 10.0.2 or greater, you can get the GTID in the next step. If the external instance you are using is MariaDB version 10.0.2 or greater, you use GTID-based replication. Run SHOW MASTER STATUS on the external MariaDB instance to get the binary log file name and position, then convert them to a GTID by running BINLOG_GTID_POS on the external MariaDB instance. Note the GTID returned; you need it to configure replication. Compress the copied data to reduce the amount of network resources needed to copy your data to the Amazon RDS DB instance. Take note of the size of the backup file; you need this information when determining how large an Amazon EC2 instance to create. When you are done, compress the backup file using GZIP or your preferred compression utility. To compress SQL output, use the following command. To compress delimited-text output, use the following command. Copying your compressed database backup file to an Amazon EC2 instance takes fewer network resources than doing a direct copy of uncompressed data between database instances. After your data is in Amazon EC2, you can copy it from there directly to your Amazon RDS MySQL or MariaDB DB instance. For you to save on the cost of network resources, your Amazon EC2 instance must be in the same AWS Region as your Amazon RDS DB instance. Having the Amazon EC2 instance in the same AWS Region as your Amazon RDS DB instance also reduces network latency during the import. In the AWS Region where you plan to create the RDS DB instance to run your MySQL database engine, create a VPC, a VPC security group, and a VPC subnet. Ensure that the inbound rules for your VPC security group allow the IP addresses required for your application to connect to AWS. This can be a range of IP addresses (for example, 203.0.113.0/24), or another VPC security group. You can use the Amazon VPC Management Console to create and manage VPCs, subnets, and security groups. For more information, see Getting Started with Amazon VPC in the Amazon Virtual Private Cloud Getting Started Guide. Older AWS accounts can also launch instances in Amazon EC2-Classic mode. In this case, make sure that the inbound rules in the DB security group for your Amazon RDS instance allow access for your EC2-Classic instance using the Amazon EC2 private IP address. For more information, see Working with DB Security Groups (EC2-Classic Platform). Open the Amazon EC2 Management Console and select the AWS Region to contain both your Amazon EC2 instance and your Amazon RDS DB instance. Launch an Amazon EC2 instance using the VPC, subnet, and security group that you created in Step 1. Ensure that you select an instance type with enough storage for your database backup file when it is uncompressed. For details on Amazon EC2 instances, see Getting Started with Amazon EC2 Linux Instances in the Amazon Elastic Compute Cloud User Guide for Linux. To connect to your Amazon RDS DB instance from your Amazon EC2 instance, you need to edit your VPC security group, and add an inbound rule specifying the private IP address of your EC2 instance. You can find the private IP address on the Details tab of the Instance pane in the EC2 console window. To edit the VPC security group and add an inbound rule, choose Security Groups in the EC2 console navigation pane, choose your security group, and then add an inbound rule for MySQL/Aurora specifying the private IP address of your EC2 instance. To learn how to add an inbound rule to a VPC security group, see Adding and Removing Rules. Be sure to copy sensitive data using a secure network transfer protocol. For more information, see Connect to Your Instance in the Amazon Elastic Compute Cloud User Guide for Linux. 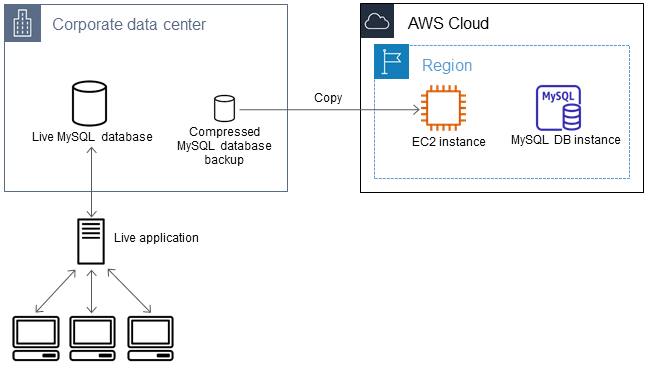 By creating an Amazon RDS MySQL or MariaDB DB instance in the same AWS Region as your Amazon EC2 instance, you can import the database backup file from EC2 faster than over the internet. Determine which DB instance class and what amount of storage space is required to support the expected workload for this Amazon RDS DB instance. This process should include deciding what is sufficient space and processing capacity for your data load procedures, and also what is required to handle the production workload. You can estimate this based on the size and resources of the source MySQL or MariaDB database. For more information, see Choosing the DB Instance Class. Determine if Amazon RDS provisioned input/output operations per second (IOPS) is required to support the workloads. Provisioned IOPS storage delivers fast throughput for online transaction processing (OLTP) workloads, which are I/O intensive. For more information, see Provisioned IOPS SSD Storage. Open the Amazon RDS console. In the upper-right corner, choose the AWS Region that contains your Amazon EC2 instance. On the Select engine page, choose MySQL or MariaDB, as appropriate, and then choose Next. On the Choose use case page, choose Dev/Test – MySQL to skip configuring Multi-AZ deployment and provisioned IOPS storage. If your source instance is MySQL 5.1.x, the Amazon RDS DB instance must be MySQL 5.5.x. If your source instance is MySQL 5.5.x, the Amazon RDS DB instance must be MySQL 5.5.x or greater. If your source instance is MySQL 5.6.x, the Amazon RDS DB instance must be MySQL 5.6.x or MariaDB. If your source instance is MySQL 5.7.x, the Amazon RDS DB instance must be MySQL 5.7.x, 5.6.x, or MariaDB. If your source instance is MySQL 8.0.x, the Amazon RDS DB instance must be MySQL 8.0.x. If your source instance is MariaDB 5.1, 5.2, or 5.3, the Amazon RDS DB instance must be MySQL 5.1.x. If your source instance is MariaDB 5.5 or greater, the Amazon RDS DB instance must be MariaDB. Accept the default values for all other boxes in this section. In the Settings section, specify the requested database and user information. Choose Next when you are done. In the Network & Security section of the Configure advanced settings page, choose the same VPC and VPC security group as for your Amazon EC2 instance. This approach ensures that your Amazon EC2 instance and your Amazon RDS instance are visible to each other over the network. Set Public accessibility to Yes. Your DB instance must be publicly accessible to set up replication with your source database as described later in this topic. Accept the default values for all other boxes in this section. In the Database options section, specify a database name. Accept the default values for all other boxes in this section. In the Backup section, set the backup retention period to 0 days. Accept the default values for all other boxes in this section. Accept the default values for the remaining options. Choose Create database when you are done. Do not configure multiple Availability Zones, backup retention, or Read Replicas until after you have imported the database backup. When that import is done, you can set Multi-AZ and backup retention the way you want them for the production instance. 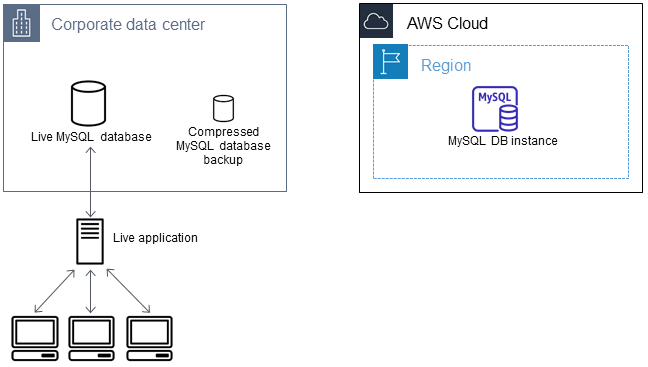 For a detailed walkthrough of creating an Amazon RDS MySQL DB instance, see Creating a DB Instance Running the MySQL Database Engine. For a detailed walkthrough of creating an Amazon RDS MariaDB DB instance, see Creating a DB Instance Running the MariaDB Database Engine. Review the default configuration options for the Amazon RDS DB instance. In the left navigation pane of the Amazon RDS Management Console, choose Parameter groups , and then choose the magnifying glass icon next to the default.mysqlx.x or default.mariadbx.x parameter group. If this parameter group does not have the configuration options that you want, find a different one that does, or create a new parameter group. For more information on creating a parameter group, see Working with DB Parameter Groups. If you decide to use a different parameter group than the default, associate it with your Amazon RDS DB instance. For more information, see Modifying a DB Instance Running the MySQL Database Engine or Modifying a DB Instance Running the MariaDB Database Engine. Connect to the new Amazon RDS DB instance as the master user, and create the users required to support the administrators, applications, and services that need to access the instance. The host name for the Amazon RDS DB instance is the Endpoint value for this instance without including the port number, for example mysampledb.claxc2oy9ak1.us-west-2.rds.amazonaws.com. You can find the endpoint value in the instance details in the Amazon RDS Management Console. 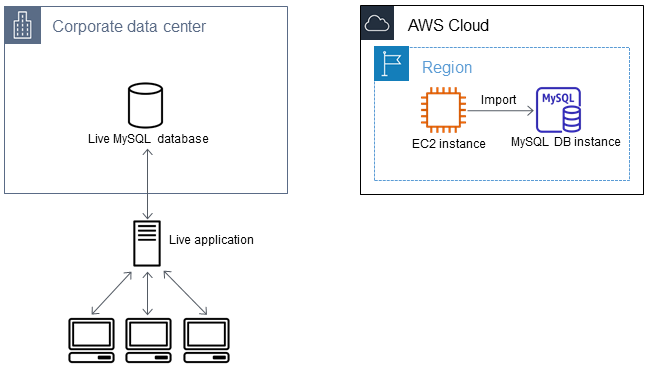 Connect to your Amazon EC2 instance. For more information, see Connect to Your Instance in the Amazon Elastic Compute Cloud User Guide for Linux. The host name is the DNS name from the Amazon RDS DB instance endpoint. At the mysql prompt, run the source command and pass it the name of your database dump file to load the data into the Amazon RDS DB instance. For SQL format, use the following command. For delimited-text format, first create the database (if it isn’t the default database you created when setting up the Amazon RDS DB instance). To improve performance, you can perform these operations in parallel from multiple connections so that all of your tables get created and then loaded at the same time. If you used any data-formatting options with mysqldump when you initially dumped the table, you must use the same options with mysqlimport or LOAD DATA LOCAL INFILE to ensure proper interpretation of the data file contents. Run a simple SELECT query against one or two of the tables in the imported database to verify that the import was successful. If you no longer need the Amazon EC2 instance used in this procedure, you should terminate the EC2 instance to reduce your Amazon AWS resource usage. To terminate an EC2 instance, see Terminating an Instance. Your source database was likely updated during the time that it took to copy and transfer the data to the Amazon RDS MySQL or MariaDB DB instance. That being the case, you can use replication to bring the copied database up-to-date with the source database. The permissions required to start replication on an Amazon RDS DB instance are restricted and not available to your Amazon RDS master user. 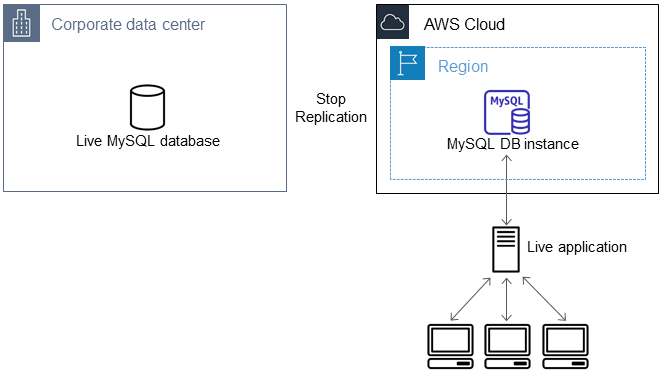 Because of this, you must use either the Amazon RDS mysql.rds_set_external_master command or the mysql.rds_set_external_master_gtid command to configure replication, and the mysql.rds_start_replication command to start replication between your live database and your Amazon RDS database. Earlier, you enabled binary logging and set a unique server ID for your source database. Now you can set up your Amazon RDS DB instance as a replica with your live database as the replication master. In the Amazon RDS Management Console, add the IP address of the server that hosts the source database to the VPC security group for the Amazon RDS DB instance. For more information on modifying a VPC security group, see Security Groups for Your VPC in the Amazon Virtual Private Cloud User Guide. You might also need to configure your local network to permit connections from the IP address of your Amazon RDS DB instance, so that it can communicate with your source instance. To find the IP address of the Amazon RDS DB instance, use the host command. The host name is the DNS name from the Amazon RDS DB instance endpoint, for example myinstance.123456789012.us-east-1.rds.amazonaws.com. You can find the endpoint value in the instance details in the Amazon RDS Management Console. Using the client of your choice, connect to the source instance and create a user to be used for replication. This account is used solely for replication and must be restricted to your domain to improve security. The following is an example. For the source instance, grant REPLICATION CLIENT and REPLICATION SLAVE privileges to your replication user. For example, to grant the REPLICATION CLIENT and REPLICATION SLAVE privileges on all databases for the 'repl_user' user for your domain, issue the following command. If you used SQL format to create your backup file and the external instance is not MariaDB 10.0.2 or greater, look at the contents of that file. The file includes a CHANGE MASTER TO comment that contains the master log file name and position. This comment is included in the backup file when you use the --master-data option with mysqldump. Note the values for MASTER_LOG_FILE and MASTER_LOG_POS. If you used delimited text format to create your backup file and the external instance is not MariaDB 10.0.2 or greater, you should already have binary log coordinates from step 1 of the procedure at To Create a Backup Copy of Your Existing Database. If the external instance is MariaDB 10.0.2 or greater, you should already have the GTID from which to start replication from step 2 of the procedure at To Create a Backup Copy of Your Existing Database. Make the Amazon RDS DB instance the replica. If the external instance is not MariaDB 10.0.2 or greater, connect to the Amazon RDS DB instance as the master user and identify the source database as the replication master by using the mysql.rds_set_external_master command. Use the master log file name and master log position that you determined in the previous step if you have a SQL format backup file. Alternatively, use the name and position that you determined when creating the backup files if you used delimited-text format. The following is an example. If the external instance is MariaDB 10.0.2 or greater, connect to the Amazon RDS DB instance as the master user and identify the source database as the replication master by using the mysql.rds_set_external_master_gtid command. Use the GTID that you determined in step 2 of the procedure at To Create a Backup Copy of Your Existing Database. The following is an example. The master_server_ip_address is the IP address of master MySQL instance. An EC2 private DNS address is currently not supported. On the Amazon RDS DB instance, issue the mysql.rds_start_replication command to start replication. On the Amazon RDS DB instance, run the SHOW SLAVE STATUS command to determine when the replica is up-to-date with the replication master. The results of the SHOW SLAVE STATUS command include the Seconds_Behind_Master field. When the Seconds_Behind_Master field returns 0, then the replica is up-to-date with the master. After the Amazon RDS DB instance is up-to-date, enable automated backups so you can restore that database if needed. You can enable or modify automated backups for your Amazon RDS DB instance using the Amazon RDS Management Console. For more information, see Working With Backups. 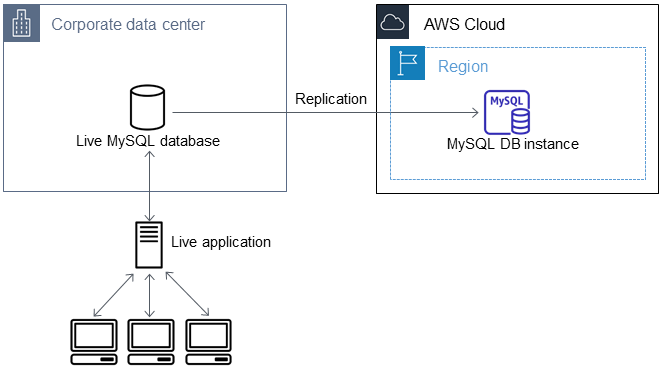 After the Amazon RDS MySQL or MariaDB DB instance is up-to-date with the replication master, you can now update your live application to use the Amazon RDS instance. To add the VPC security group for the Amazon RDS DB instance, add the IP address of the server that hosts the application. For more information on modifying a VPC security group, see Security Groups for Your VPC in the Amazon Virtual Private Cloud User Guide. Verify that the Seconds_Behind_Master field in the SHOW SLAVE STATUS command results is 0, which indicates that the replica is up-to-date with the replication master. Close all connections to the source when their transactions complete. Update your application to use the Amazon RDS DB instance. This update typically involves changing the connection settings to identify the host name and port of the Amazon RDS DB instance, the user account and password to connect with, and the database to use. Stop replication for the Amazon RDS instance using the mysql.rds_stop_replication command. Run the mysql.rds_reset_external_master command on your Amazon RDS DB instance to reset the replication configuration so this instance is no longer identified as a replica. Enable additional Amazon RDS features such as Multi-AZ support and Read Replicas. For more information, see High Availability (Multi-AZ) for Amazon RDS and Working with Read Replicas. If you no longer need the Amazon RDS instance used in this procedure, you should delete the RDS instance to reduce your Amazon AWS resource usage. To delete an RDS instance, see Deleting a DB Instance.